Esta unidad se puede alquilar como 3 dormitorios. La tercera sala tendrá 2 dobles y un baño completo. Por favor llame a las tasas. En Dillon por el lago, es ideal para el turista que quiere tener acceso central para el esquí, el golf, tiendas y restaurantes. Disfrutar de las montañas y vistas al lago Dillon desde su propio patio privado. Las instalaciones de la casa club tienen una piscina cubierta, jacuzzi y servicio de lavandería. Su grupo se encontrará convenientemente cerca de tiendas, restaurantes, teatros, conciertos y festivales. El servicio de transporte para cerca y se puede llevar a donde quiere ir; esquí de clase mundial, golf o ir de compras. Quedarse y jugar en el lago Cliffe con Wildernest alquiler de vacaciones para las vacaciones perfectas y un fácil acceso a todas las actividades de invierno y verano que hacen de sus vacaciones completas. Internet. No Fumar. Esta propiedad es administrada por Wildernest Vacation Rentals ,. Check in was easy.Instructions to find the condo were easy to follow. Unit was spotless. 3 bathrooms were full if towels nicely presented like in a hotel.Blow dryers,samples shampoos, conditioners, soaps. Kitchen had really everything you need including:mixer,coffee machine,toaster, all new.Plenty of good quality glasses and dishes. TV in all 3 bedrooms.extra pillows and blankets in closets. Gas fire place with timer. Comfortable couch and chairs, one recliner. Good quality furniture. Exceptional views on the lake. Condo right by the Marina.Quiet when we were there in October. Plenty of restaurants near by. Overall excellent stay. Will book next year. The location of our condo couldn't be better for viewing the mountains and Dillon Lake. It was convenient for hiking local trails, shopping at the outlets in Silverthorne, and enjoying local restaurants. We also toured the Summit County Parade of Homes, took the Georgetown Loop Railroad trip, and drove through the mountains to enjoy the Fall colors. Besides the wonderful location of the condo, the fact that it was on the first floor made it easier for some members of our family to manage getting in and out of the condo without steps. This was a spacious and comfortable condo for our vacation, and I would do it again when we visit our family in the future. Perfect ! This corner property had a magnificent unobstructed view of the lake. We spent much time on the porch. Being right at the marina was so convenient for our pontoon boat rental. William, thank you for your review! 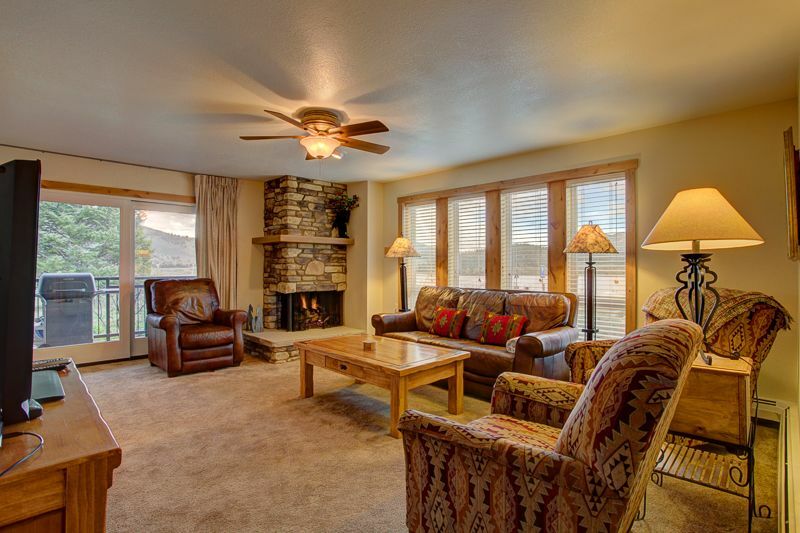 We have used Summit Realty for our stay in Dillon/Silverthorne for years as a family. We usually stay up in The Wilderness Timberridge but With a move, a new baby, work obligations and health issues with my dad we were not able to attend the same time with all of our family. Since my husband and our kids are just in the Springs and this is an annual love for our family before school starts we decided just to come up for a quick weekend and stay on the lake. I have to say this is an absolutely amazing location, the views are beautiful and the convenience of this unit to the pool, the marina, the beach, the amphitheater, the playground and the restaurants is great. We enjoyed the ampitheater music both Friday and Saturday night and even walked down and attended church on Sunday. The pool and hotubs were clean and warm. The unit itself was very very nice, updated everything, clean, clean, comfortable beds and furniture. Very cozy! Very well stocked kitchen. We only used the 2 bedrooms but will definitely book the 3rd bedroom next stay. We really loved this unit and location. We would highly recommend it. Samantha, thank you for the detailed review of Lake Cliffe 108C and your Summit experience. Great Location and Great Managment Company! this location was the best, by everything we wanted in Dillon and very quiet. Very clean, great location, affordable, and comfortable!